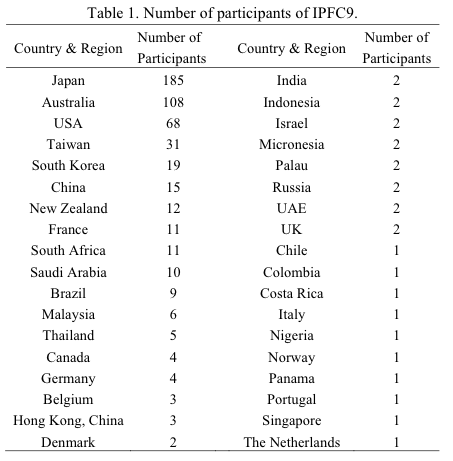 The 9th Indo-Pacific Fish Conference (IPFC9) was held in Okinawa, Japan from 24th to 28th June 2013 under the auspices of the Organizing Committee of IPFC9, the Ichthyological Society of Japan and the Okinawa Churashima Foundation. Five hundred and thirty two delegates from 36 countries/regions around the world attended (see below). Welcome Reception. This event took place in the Laguna Garden Hotel next to the Okinawa Convention Center (Venue of IPFC9) in the evening of 23rd June 2013, one day before the official start of the IPFC9. The welcome reception started with traditional dance performance followed by a welcome address by Keiichi Matsuura. For the 320 delegates who attended, it was good opportunity to catch up with old colleagues and to meet new people. Opening Ceremony. The opening ceremony started with a welcome address by Keiichi Matsuura, the Chair of Organizing Committee of IPFC9, who gave a brief introduction to Okinawa. His address was followed by opening remarks by Seishi Kimura, President of the Ichthyological Society of Japan, who discussed the Society and its contribution to the understanding of fish diversity. Plenary Presentations. The winners of the two IPFC9 Bleeker Awards, Jeffrey M. Leis (Ecology) and Gerald R. Allen (Systematics) provided excellent talks on “Change in the early life-history of Indo-Pacific Fishes” and “The center of Indo-Pacific reef fish diversity.” Their talks were followed by three talks by invited speakers: Thomas J. Near, (Phylogeny and tempo of diversification in the superradiation of acanthomorph fishes); Philip L. Munday, (Is ocean acidification a threat to marine fishes? ); and Jeffrey M. Leis, (Pelagic Indo-Pacific reef fishes: Remarkable animals doing remarkable things). Farewell Party. More than 400 colleagues attended the farewell party held at the Food Colosseum in the Duty Free Shop near Omoromachi monorail station in the evening of Thursday, 27 June 2013. Attendees enjoyed the food and drinks of Okinawa, and socialized with old friends and new colleagues made during the conference. Excursions. Scientific sessions finished in the afternoon of Thursday, 27th June 2013. These were followed by four excursions on Friday, 28th June: Okinawa Churaumi Aquarium and northern Okinawa cultural tour; Okinawa Churaumi Aquarium with behind the scene tour; Shuri-jo Castle and Naha area; and Diving Tour on Central West Coast of Okinawa (the scheduled Kerama Islands tour was cancelled due to strong wind). Total number of excursions participants was 163. Other Meetings. A satellite symposium entitled “The filter feeding elasmobranchs; Unraveling their many mysteries” was held at the Okinawa Churaumi Aquarium on Saturday, 29th June with 60 participants. Seven interesting talks on filter feeding elasmobranchs including Whale Shark, Manta, Basking Shark and Megamouth, were presented by leading elasmobranch experts. Another symposium entitled “Systematics and Diversity of Fishes” was held at the National Museum of Nature and Science, Tokyo, with 90 participants on Saturday, 6th July, a week after the conculsion of IPFC9. Seven invited speakers presented talks on various subjects pertaining to the diversity and phylogenies of fishes. His Majesty the Emperor attended a social mixer in the evening to meet with the invited speakers and other participants. Donations. 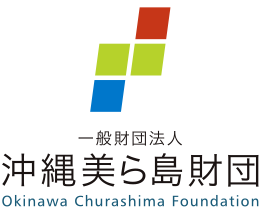 The IPFC9 is generously supported by large donations from the following organizations: Ichthyological Society of Japan; Okinawa Churashima Foundation; Nippura Company, Limited; Sumitomo Chemical Company, Limited. I am also grateful for donations from the following people and organizations: Izumi Akagawa, Kunio Amaoka, Hiromitsu Endo, Atsushi Fukui, Fukuyama Consultants Co., Ltd., Ysunori Furuya, Akira Goto, Kiyoshi Hagiwara, Kiyotaka Hatooka, Masayoshi Hayashi, Kazuo Hoshino, Yuji Ikeda, Hideyuki Imai, Hishashi Imamura, Tetsuo Iwami, Yuko Iwatsuki, Tetsuya Kaga, Osamu Katano, Seishi Kimura, Nobuhiro Kumazawa, Kohji Mabuchi, Ken Maeda, Keiichi Matsuura, Hiroyuki Motomura, Tetsuji Nakabo, Masanori Nakae, Yohei Nakamura, Yukinobu Nakamura, Mutsumi Nishida, Non-Profit Organization Shigotonin Club, Hiroko Ohno, Ryosuke Ohno, Makoto Okada, Muneo Okiyama, Okinawa Institute of Science and Technology, Orion Breweries, Ltd, Makoto Sakurai, Mitsuhiko Sano, Kunio Sasaki, Hiroshi Senou, Gento Shinohara, Takayuki Sonoyama, Hideki Sugiyama, Shigeo Tabata, Kazunori Tachihara, Tachihara Laboratory (University of the Ryukyus), Katsutoshi Watanabe, Shun Watanabe, Yoji Yamada, Takeshi Yamakawa, Yusuke Yamanoue, Atsumi Yamasaki, and Taiga Yodo.